“If poets would have us fall for them, this is a poet to fall for. But be careful where you go. In Linda Ann Strang’s first collection of poems, Wedding Underwear for Mermaids, one sets out from the unsettling banks of its title, a purposefully slippery trope that will have you wrapping your mind around an image as elusive as the legendary undine herself. And you are right where the poet wants you: in the elemental waters of the subconscious while grounded in familiar earthly and cultural spheres, a feat few poets manage as convincingly as Ms. Strang does. 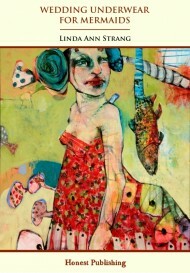 Linda Ann Strang's first poetry collection skilfully entwines fairy tales, womanhood, African culture, and the female psyche. The warrior mother, the spurned lover, the maltreated bride: they are all here, expertly drawn in lush, original language that you'll want to wallow in from beginning to end. This heady mix of fairy tales, African culture, pagan myth, and feminist thought carries the reader on a wave to the surreal and the enchanting. Like the siren's call, this mind-expanding trip through the female psyche pulls readers in with beautifully crafted language that is bold, intimate, provocative, and sensual. I fell into him and other nightmares. of course in Technicolor, myself. I played a supporting role. from the heart’s oozing oyster. and let my husband watch. I remember my wedding day. in his dog collar, reaching for the chain saw. Yes, I take it, I take it, and I’ll take it some more. and a wedding ring. He aimed the remote. Click here to read a full excerpt. This book is tagged with: africa, Alan Botsford, carillon, kindle ebook, kindle ebooks, Linda Ann Strang, motherhood, new ebooks, new kindle ebook, Poetry, poetry publishing, south african literature, south african poetry, the cape times, Wedding Underwear for Mermaids. This entry was posted on Saturday, May 12th, 2012 at 11:32 am and is filed under Kindle Book Store, Our Books, Poetry. You can follow any responses to this entry through the RSS 2.0 feed. You can leave a response, or trackback from your own site.